Naming things are hard, picking a great name is even harder and finding a name for a new privacy focused cryptocurrency was no exception. I knew what I wanted the name to represent, but could not find the words for it until the word Stellite jumped out at me at the back of a chemistry textbook. A quick Google search revealed that Stellite displays outstanding hardness and toughness, and are also usually very resistant to corrosion. Perfect for our cryptocurrency. 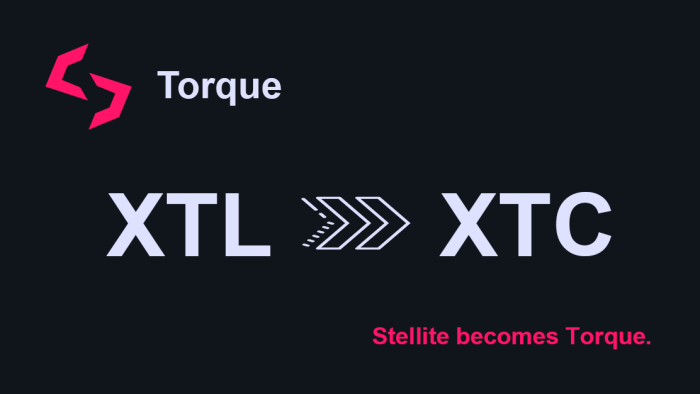 The Stellite name is a registered trademark of Kennametal Inc. Something we only learned last week when they got in contact regarding the use of their trademark. They’ve requested us to change the name, and we’re happy to comply. The deadline for the change is on the 25th of April 2019. We had a lot of discussions internally until we agreed on Torque using the ticker XTC. Short, powerful. It’s a force that causes something to turn, or the power of such a force. This aligns well with our vision, let’s change the way people think about money, the way they earn money using their devices and turn cryptocurrencies into something everyone can use. We’ve already started the rebranding process as you’ll see on GitHub. We will be rebranding all our software as well as get in contact with everyone that requires the update. You can expect a new release of Torque in the coming weeks.